A few weeks ago someone sent us a link to an online article on the UK’s Guardian website. Here is the tagline above the slideshow of images: A new book, Reef Fishes of the East Indies, is the culmination of a combined 60 years’ work to document the biodiversity of the hugely diverse coastal waters of the region. The three-volume publication features the 2,631 known reef fishes of the Indian subcontinent, including 25 species new to science. Here is a selection of images from the book. Below is the first image in the series. Judging by placement only, it is the one the Guardian considered to be the most important shot. 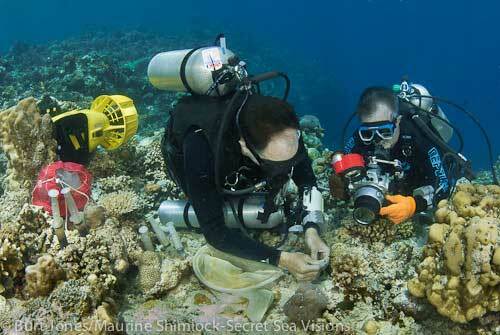 The book's authors at work photographing a new species in Cendrawasih Bay. Photograph: Jones/Shimlock. Secret Sea Visions/Conservation International. We were very happy to receive that link, knowing that Dr. Gerry Allen’s and Dr. Mark Erdmann’s work is receiving international attention. 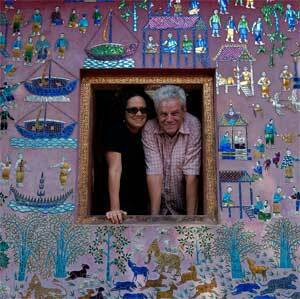 We contributed many images to the book, and have worked with both authors for years. The image in question was shot on our 2010 survey to Cenderawasih Bay. All of us believed that it was a good image, which showed the scientists working underwater. We were not prepared for the deluge of negative, accusatory emails that followed. Despite the caption, many folks believed that the image showed Burt and me photographing. Most of those emails said things like, “congratulations for destroying the reef”; “how could you do such a thing?”; “this is a great example of how NOT to take pictures”; “a great example of how not to do science”; “you call yourselves conservationists while blatantly destroying reefs”; “you are two-faced and liars”; etc., etc. Firstly, we are the photographers, not the people in the picture. Sort of hard to do both at the same time and neither of us is bald! Yes, there were parts of Erdmann and Allen’s equipment touching the reef. Yes, parts of them are touching the substrate, too. But take a good look at the substrate. Most of it is not healthy coral, and the scientists have placed their equipment where it does the least harm. b) though Dr. Allen and I are indeed very close to the substrate to get the shot required for the description of the fish, both of us have well over 10,000 dives under our respective belts and most definitely are not “laying on the coral” and crushing it. c) though the process of collecting and documenting new species may seem objectionable to some (and I certainly respect that opinion), it is in fact a “necessary evil” if new species are to be described and our global biodiversity heritage cataloged properly. I note that our efforts to describe patterns of biodiversity across the East Indies (and especially to highlight areas like Cendrawasih Bay that have high numbers of endemic species found nowhere else in the world) have helped governments in the region to prioritize where they invest conservation dollars and has led to the gazetting of millions of hectares of new marine parks – including the 1.5 million hectare park that now protects the marine biodiversity of Cendrawasih Bay. Finally, as I think is made clear above, there was no attempt to “alter the habitat to get the shot” – I had brought up a cryptic new species from 70m depth that would be impossible to photograph in situ due to its behavior of living deep within the reef interstices, and we were simply photographing the anaesthetized animal to document its living coloration for the purposes of the new species description. Again, I have no desire to quarrel and I very much respect your concern for diver/photographer behavior on reefs. I only note that the activity documented in this image is an important part of the scientific process that documents new species and directs governmental attention for conservation efforts, and I can assure you that we actively strive to minimize any damage to the reefs from our surveys. Thank you for your concern on behalf of the world’s reefs – I can only affirm that we also share this concern. Thanks for your understanding. Mark hints at the primary issue here: differentiating between sport diving and scientific research. We’ve all been educated; no one thinks that the hundreds of thousands of certified sport divers should be allowed to crush coral, spear fish, dump their gear on the reef, or harass marine life. But, we also need to realize that the few marine biologists working in the field who may, in the course of their research, inflict some damage to the environment they love and have devoted their lives to, do so with the utmost caution and respect. Those of us who have learned about the marine world through their invaluable work understand that there is a conundrum operating here. (You could apply this same conundrum to not using a computer because you oppose gold mining, not using paper because you oppose cutting trees; not driving a car because you oppose drilling for oil.) Gaining knowledge and experience often requires a few sacrifices. One of the women who dives often with us is a research PhD with MD Anderson Cancer Center. In the course of her work she has had to sacrifice thousands of mice, searching for a way to prevent cancer. She told me that in her office she has made a small shrine to honor those mice. I think that’s pretty cool! Burt and I do our utmost to leave a reef looking like it did before we dived it. We encourage those who travel with us to do the same. We are often discouraged by reports of reef damage, unhealthy seas, vanishing marine life and so on. The research done by scientists like Dr. Erdmann and Dr. Allen, whose intent is to conserve and protect the environment for all to enjoy, is one of our most promising prospects for maintaining healthy reefs far into the future. Let’s all get back to work. I can’t believe you received so many angry responses. Yes, they are touching the reef. A “few” divers in the name of science aren’t hurting the environment. It’s the “thousands” of sport divers touching coral that creates the problem. Jones and Shimlock are correct….sometimes sacrifices of a few are made in the effort to save the rest. Thanks, Michele. I totally agree and that’s the reason I wrote this blog. Bearing the brunt of so much public scorn must be difficult, but I’m glad that so many divers have had this reaction. It’s a great sign that the community recognizes the importance of protecting and preserving these ecosystems. Often, I see people casually engaging in environmentally destructive behavior without thinking or caring about the effects of their actions. Maybe the rising popularity of diving will help spread the knowledge of why we should all be working to protect our oceans. Thanks for your comments, John. Just for the record we did not offer the image for publication. Indeed it was a total surprise when all of this began. Dr. Allen selected several of our images to use in his book. I can only assume that whoever is in charge of publicizing the book picked the images or that someone from Conservation International submitted the images to the Guardian. Not that we wouldn’t have submitted it. We might have mainly because we found nothing offensive in the image, neither did CI, nor did the authors. But you are correct, learn and move on. As the Technical Editor of a diving magazine, I have to be constantly vigilant for pictures that might ‘offend’. Because I an away diving so much, many get past and into print but none as flagrant as this one, which appears to have ‘gone viral’ on diving Internet sites. I think that you made a mistake offering it for publication. No-one cares who the divers are. I guess, we must all learn from our mistakes and move on.